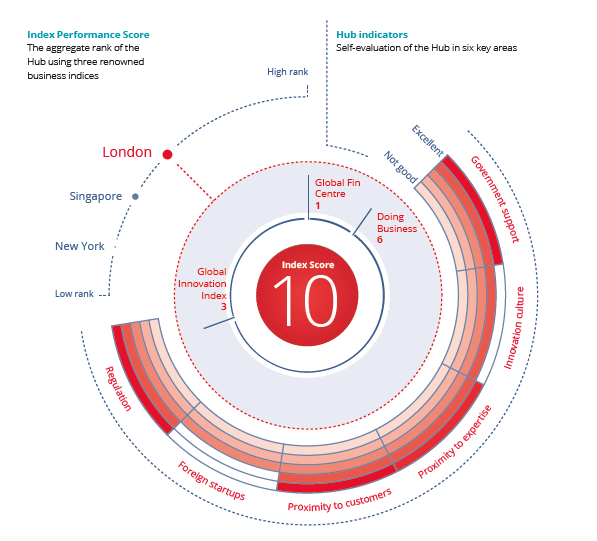 with the best (lowest) Index Performance Scores are: London, Singapore, New York, Hong Kong, and Silicon Valley. 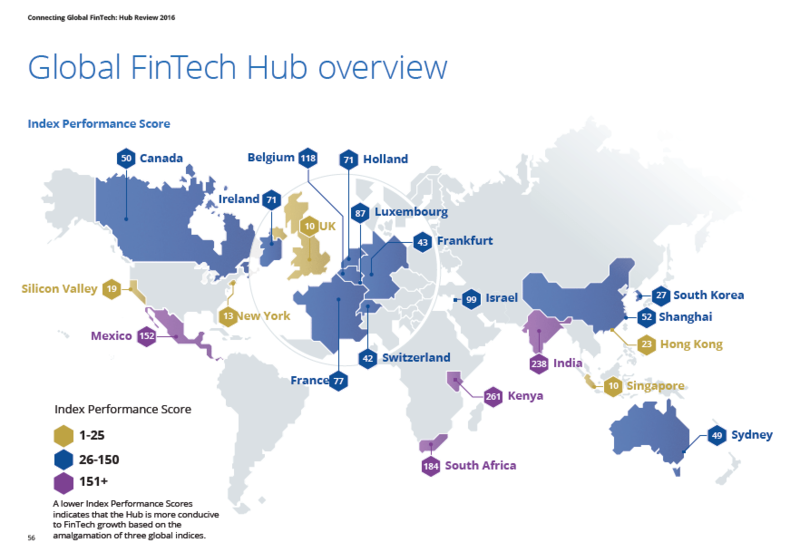 London scored the best Index Performance amongst the other fintech global hubs. London is the world’s largest financial sector, which has a strong regulatory framework, solid government support and advance technology ecosystem. Some of its top Fintech companies are, Crowdcube, Kantox, LendInvest, Market Invoice, Worldpay and Zopa. The main challenges that London has as a fintech hub are its high cost of living, office space and labour. There is no surprise that Singapore is one of the top fintech hubs, with strong government support where S$225m funds are committed in the development of fintech projects. The industry is also supported by many strong fintech focused accelerators and venture capital/investors. New York is without doubt the leading global financial hub and its largest and most established financial services institutions. 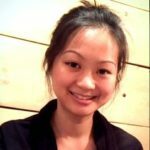 The report stated that they are expecting to see a higher level of collaboration between fintech and financial institutions in order to scale up their activities. Silicon Valley is the land of tech startup from Apple, Google to Facebook. It is also the homeland of many successful fintech startups namely PayPal, LendingClub, Stripe and Prosper. Largest contribution to its success is the ingrained culture of innovation and its expertise in building and scaling businesses into a global company. Hong Kong has long positioned itself as ‘Asia’s super connector’ especially for B2B solutions. It is also a hub for expansion into China and vice versa. Their core innovation areas are in FX, e-commerce, wealth management, cyber-security and robo-advisors.